Today's mission is to declutter kids books, from their bedrooms, playrooms, or whatever other living space in your home you keep them. The mission is designed to be done while working on the Organize Books Challenge here on the site, which is part of the 52 Week Organized Home Challenge. As always, when discussing any decluttering mission, I also am not suggesting that you get rid of ALL of your children's books. Certainly not! I am a firm believer in there being books in any home with kids, because reading is such a fundamental part of education, gaining knowledge, and becoming a well-rounded human being. However, it's important to periodically review what kids books you've got and cull out those which have been outgrown or otherwise shouldn't be taking up space in your home anymore. 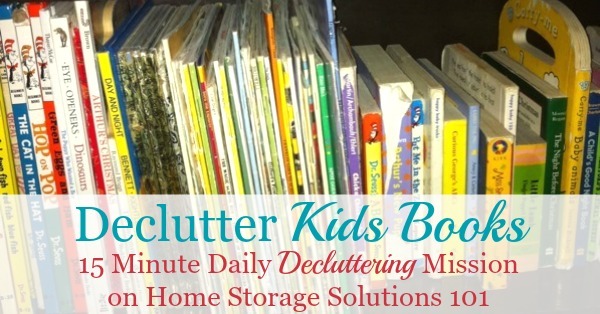 This mission is part of multiple days designated in the Declutter 365 calendar to get rid of book clutter, and on the first day of these missions I provided you with these 5 questions to ask yourself when decluttering books to help you decide which books to keep and which to remove from your home. Those five questions will help you with today's mission as well, so take a moment to review them. However, there are some additional considerations you may want to take into acount when deciding which kids books will stay in your home. books? - We all know how kids books can get outgrown by kids, starting with board books, beginning and easy readers, and progressing up through their reading levels. 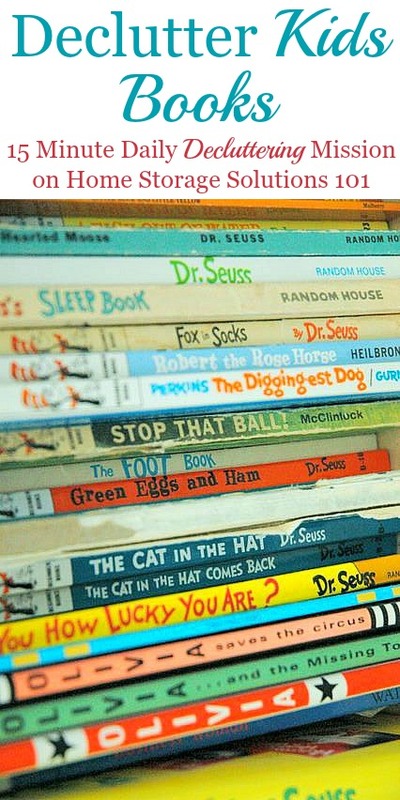 If your child (and younger siblings) have all outgrown one of the stages of reading, you may want to consider getting rid of some of those books to allow other children, outside your home, the opportunity to read them instead. Is the book well written and/or illustrated? - Some children's books are wonderful, and some are really kind of drivel. We've all seen the good ones, like classics, or well written or illustrated stories that while, meant for kids, can also entertain and be thought provoking for adults as well. These quality books are the type you should at least consider keeping (assuming you have room for them in your home). Instead, get rid of the books with flat, boring, undeveloped characters, books that are essentially summaries of movie or television show plot lines, or other fluff reads that are easily forgotten. What condition is the book in? - Kids can be hard on books, especially when the children are younger. Is the book falling apart, or ripped or the binding broken beyond salvaging? If so, it may be time to let it go. The answer to this question can also help you decide whether a particular book should be donated or sold, or instead added to the recycling bin. If you're a bibliophile like me, or your kids are as well, read on below to get some hints for when it might be time to tackle this mission, as hard as it might be to choose which beloved books to keep versus get rid of. 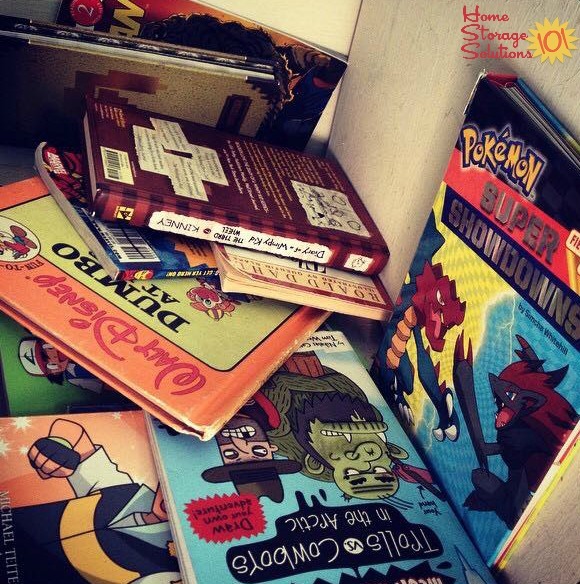 If you or your kids love books, it's easy to accumulate a lot of them, quickly. However, I've found that one of the best ways to know if it's time to take on this mission is when the books start to get out of control, and you are frequently needing to deal with them. 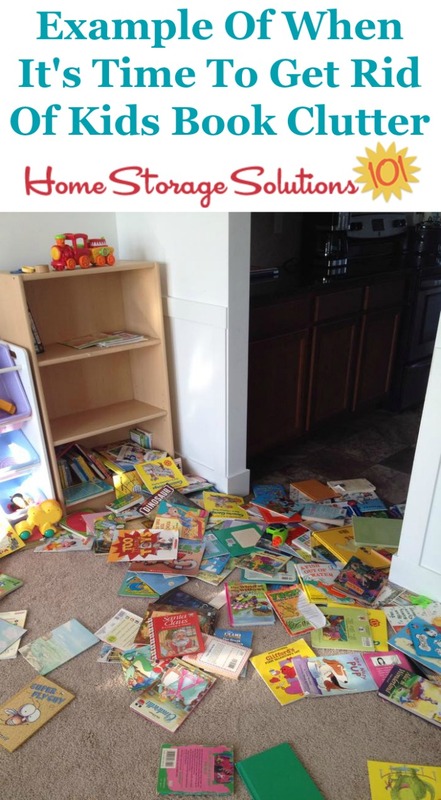 If whatever organizational or storage system you have for books is constantly getting messed up, and things are always out of place, it's time to tackle the problem. This can eventually mean you need to change how you organize the books, but the first step of any organization project is to declutter. 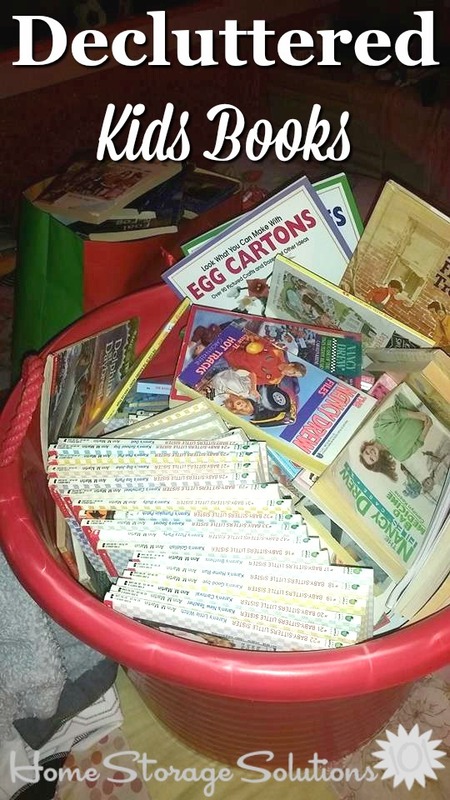 This photo above is from a reader, Deb, who wanted to know how to deal with this issue -- when the kids keep pulling out all the books and scattering them everywhere. My response, at least as a first step, is you guessed it, get rid of some of them! It'll help you and your kids love reading more, when you get to spend more time looking at and reading the books, then dealing with excess ones that are just clutter. 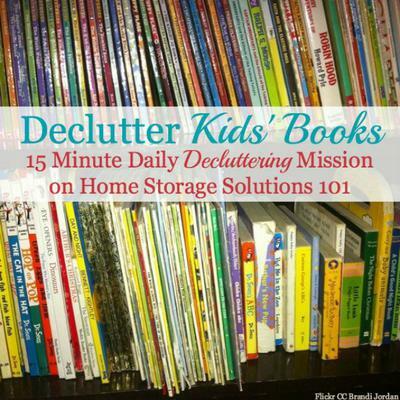 Are You Ready To Get Rid Of Children's Book Clutter? Are you ready now to tackle this decluttering mission for yourself? I hope so. To get you inspired, the picture above was sent in by a reader, Heidi, showing what she accomplished when she did this mission. She said, "Just went through our book shelves. All the books are out of here (going to 4 different younger cousins). I saved less than 20 books during this purge. The favorite ones we kept have been in the family 2 generations now and will be saved for the next generation." As you declutter these books, you may wonder what to do with them after you decide they'll leave your home. Check out these two articles with more ideas for what you can do with the books, including donating and selling them. I hope seeing these pictures, and reading this article has inspired you to get rid of your own book clutter in your home.